Government-hired workers tasked to demolish Larung Gar's cabins seen at rest. Larung Gar's monks and nuns amble by, resigned against the larger forces affecting them. China is demolishing homes and evicting thousands from Larung Gar, the world’s largest Tibetan Buddhist institution. At the eastern end of the vast Tibetan Plateau lies a sprawling monastery named Larung Gar, which is the largest Tibetan Buddhist institute in the world and a monumental landmark to Tibetan culture, religion, and history. But in June 2016, the Chinese government in Beijing issued an order that stated the site had become overcrowded and its population had to be reduced to a maximum of 5,000 by October 2017. They were then forced to board buses and were taken away. Last year around 3,730 residents were made to leave and 172 monks’ residences and 1,328 nuns’ residences were destroyed — a total of 1,500 residences demolished. Further demolitions began earlier this year. “The entire process — from eviction through to demolition and finally to forced removal by bus — is opaque,” said a spokesperson for advocacy organization Free Tibet. 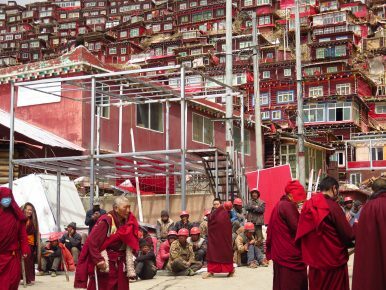 As pictures began to emerge of the destruction, human rights groups and international organizations called it a crackdown on religious freedoms and an attempt by the Chinese government to destroy an icon of Tibetan culture. But with travel to the area severely restricted for international travelers, the media, and aid organizations, it was almost impossible to see first-hand what was taking place. However, one young Canadian-Chinese man was able to reach Larung Gar due to his Chinese background and ability to speak fluent Mandarin. In early 2017, David Chan traveled to Chengdu, the capital of China’s Sichuan province and the closest major city to Larung Gar, where he joined a group of Chinese tourists. Chinese citizens are permitted to visit Tibet as part of China’s push to make the region an attractive destination for both tourism and resettlement. “I met a few Chinese tourists who wanted to go; I didn’t know them beforehand,” Chan said. “We then joined one of a number of very small tours. Drivers take groups of maybe three to five in SUVs and you need the driver’s knowledge to reach Larung Gar. Without these groups it would have been very difficult to get there. “It was a very long journey from Chengdu and as we traveled we all got to know one another. When I asked my companions about Tibet they gave me the state media’s account of things. I was told that Tibetan people are very prosperous, that the Chinese government takes good care of them, that they are given money by the government for their land, and that their livestock can be sold to the Chinese government at a very premium price, and they have large tax subsidies, many things like that. Tibetans have campaigned for freedom ever since Chinese forces began an occupation of their land in 1950. The Chinese government claims that accusations of oppression in Tibet are a myth and they say that Tibet becoming part of the People’s Republic of China has been overwhelmingly good for the population. When looking at Tibet’s economic development today it can be argued that China is correct in saying that they have improved the region by introducing things such as highways, railways, hotels, and electricity but that is only if you are looking at the situation on the surface. Jobs from tourism, infrastructure, and construction projects are also primarily awarded to Han Chinese migrants and in some areas Han Chinese migration has been so extensive that Tibetans have been made a minority their own country. People face arrest and punishment for “crimes” as simple as displaying a Tibetan flag or publicly protesting. It took two days for Chan to reach Larung Gar from Chengdu and he had to pass through two road blocks which were patrolled by armed sentries. Throughout the journey he was regarded as a domestic tourist. The tourist group arrived at a time of year when demolitions had not fully resumed after the winter season. “The level and extent of demolitions varied across different parts of the monastery complex. At some parts, it appeared as if strips of residences were being cleared out, and at some other parts, I saw numerous homes spray painted with numbers and earmarked for demolition. There was also debris lying around. I think I saw quite a lot of it. Bulldozers too,” Chan said. “The demolitions were extensive but not widespread. By saying this, I mean to say that it was not all of the residences which were being destroyed. Some were, and some were not. There were also modern concrete residences being built by the government, alongside the original homes. Unlike the tourists that accompanied him, Chan was keen to do more than just take photographs. To understand more about what was going on he wanted to talk to the monks and nuns directly. “I separated myself from the rest of the group by going to a narrow alley way and I must have tried to speak to at least 20 different people but none would talk to me. Then I recalled that in the Brad Pitt movie Seven Years in Tibet, two European mountaineers managed to get through to a Tibetan village chief because they showed them a picture of the Dalai Lama. So I got a picture of him on my phone. It was by this method that I finally met a nun who was willing to engage with me. Free Tibet does not entirely dismiss the notion that Larung Gar may have become overcrowded but they say that the way that China is dealing with it is the problem. The group argues that evicting people and driving them thousands of miles away before forcibly destroying their homes does not demonstrate concern for safety and security, nor is it a policy that is seen elsewhere in major Chinese cities that also face problems with overcrowding. Based on what he saw first-hand; Chan says that he believes that what was occurring was a case of economics and development trumping cultural and historical sensitivity. “This appeared to be more about rejigging the area for tourism and economic activity. The negative impact on the monks’ and nuns’ chosen lives appeared incidental. I didn’t see this as an outright wiping out of the monks’ and nuns’ practices. But it was still an injustice because their voices had apparently not been given a fair and considered hearing by the Chinese government. “I was told by both the nun and my Chinese driver that the government wants to make the place popular for tourists. The government seems to recognize that the place is quite unique in the world and they want to play down the political problems with Tibet. “They also want to keep much of the basic Tibetan architecture so when tourists come they can see all these nice buildings and history. Now, this is all well and good but the huge cultural cost is that eventually it will no longer be a pure Buddhist academic place, it will become a tourist attraction. “Making this even more evident is the hotels, which are about a five-minute drive from Larung Gar in the township called Serthar. Our driver took us to one of the many new hotels that had been built here by Chinese companies. “The place we were taken to had at least at the same interior finishing standard as as a three or four-star international hotel. You had marble flooring in the lobby, you had big and very comfortable beds, and with this place being about 4,000 meters above sea level, this hotel even had individual oxygen pumps in each room. If you come down with altitude sickness – which people often get at around 4,000 to 5,000 meters – this hotel had a pump and you can just attach a mask and you can then breathe pure oxygen. The hotels are part of a much larger project, according to Washington-based International Campaign for Tibet (ICT), which released a report in March titled “Shadow of Dust Across the Sun: How Tourism is use to Counter Tibetan Cultural Resilience.” In this report the group claims that demolitions in Larung Gar and Yachen Gar — another Buddhist complex in Sichuan province — are aimed at transforming two of the world’s most famous Buddhist institutes into tourist destinations. Chan felt that this development work appeared to not only be detrimental to important historical and cultural sites in Tibet but, as a side effect, also threatened to gradually dilute Tibetan culture. “I noticed that Serthar likely used to be very Tibetan but these hotels were being built by people who don’t speak Tibetan. And then you also find that there are stalls beginning to appear selling Chinese goods. “I spoke to my driver about this and he said that the Chinese government will tell people go to Tibet, set up a life there, set up a farm, grow your own crops. It can be a fresh start away from the big cities and if you choose to live away from the cities you can have a good life. “For example, there are now thousands and thousands of Han Chinese citizens living in Qinghai province. They go there, build a house and they settle there. Over time this leads to the place becoming more Han than Tibetan. Perhaps many years ago it was 10 percent Han but then it grows to 20 percent, 40 percent, 60 percent. I think the government wants to convert Eastern Tibet to make the Han population the majority. Not to eliminate the Tibetans but maybe make eastern Tibet 60 percent Han Chinese and 40 percent Tibetan. “It is important that people care about this because the local Tibetans don’t seem to have a voice. Many don’t speak English or Mandarin and as the government does all these things it has very large impact on their lives. I can appreciate the intentions of the Chinese government in wanting to develop the area, but the huge and irreparable cost in terms of undermined cultural heritage seems to be something that the officials do not fully appreciate. Steve Shaw is a UK-based journalist. His work has been published in New Internationalist, Global Comment, The Tibet Post International and Warscapes magazine. He is currently a news reporter for Archant media, publisher of the UK’s biggest selling regional newspaper, Eastern Daily Press. Takster tells a story of modern China: lingering poverty, resurgent Han nationalism, and persecuted minorities.